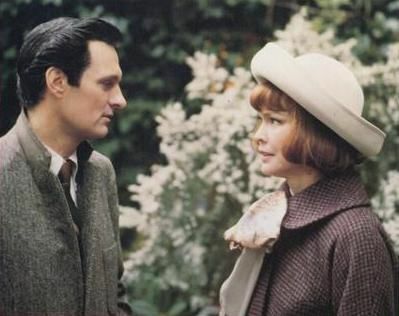 George (Alan Alda) and Doris (Ellen Burstyn) are staying separately at the same California resort inn on the Monterey coast one weekend in 1951. He’s there on business to do the taxes for a client who owns a winery and she’s there because her husband and her kids are visiting her mother-in-law and the mother-in-law cannot stand Doris who she thinks tricked her son into getting married. So Doris tells her husband she’s going to a Catholic retreat so he won’t worry about her being alone. One night George and Doris are the only ones having dinner in the inn’s main dining room. They look up, their eyes meet, they smile and before they know it, they’re having dessert and coffee and they talk. And talk. And talk. And before they know it, it’s the next day, they’re waking up in each other’s arms and they’re in love. Neither one of them wants to leave their spouses. They both have responsibilities to their children and the people they have back home. So they hit on a novel arraignment: every year on the same weekend they’ll stay at the same inn in the same room and spend a weekend together. And it’s an arraignment that lasts for 26 years through laughter, tragedy, good times and bad. During the course of the movie we see how the couple grow and develop along with the changing attitudes of the country. Doris goes from being a somewhat naïve suburban housewife to anti-Vietnam War protestor /middle-aged college student to sharp and confident businesswoman. George starts out as a high strung, neurotic accountant who is comically unsure of himself, goes to 70’s therapy addict and finally ends up as a mature adult man who is able to see himself for what he is, deal with it and be happy. It’s quite a range for both of the actors as they’re on screen every minute of the movie. It was based on a play and the movie is virtually like a play since except for a few brief scenes that take place in the inn’s dining room and outside the cabin they stay in, the whole movie takes place indoors with just the two characters talking. Alan Alda’s performance at the beginning of the movie is the one thing that might make you want to stop watching the movie. 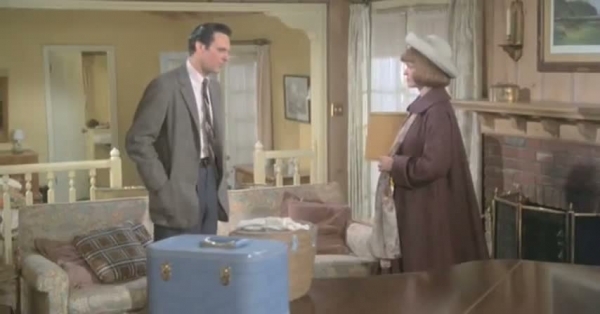 He really overacts badly during the scenes where Doris is having a baby and (no, it’s not his) and for a brief few minutes turns the movie from light romantic comedy to almost Jerry Lewis style nuttiness. He’s much better in the later scenes where he’s playing an older, more sedate George, especially during a painful scene where George has to tell Doris why he has changed from a happy-go-lucky liberal Democrat to an almost fascist, bitter Republican. Ellen Burstyn is clearly the better actor of the two and she knows how to play this material for all it’s worth due to her experience in Neil Simon comedies as well as having done this play on Broadway and one of the best things about the movie is watching her character grow and develop. It’s almost a history lesson on the woman’s movement from the 1950’s to the 1970’s watching Doris change fashions and attitudes. SAME TIME, NEXT YEAR doesn’t have what I would call a conclusion. Instead it has a resolution that some might find unbearably corny but I thought fitted the tone of the movie just right and was the only way that these two characters could have ended up. It’s a sweet little movie that I think is probably closer in realism to how a lot of married people conduct affairs rather than the cutesy-poo convoluted over plotting of most romantic comedies. The actors are good, the characters are likeable and I have to admit that by the ending credits when the theme song by Johnny Mathis and Jane Oliver swelled into full sentimental mode I found myself pretending I had something in my eye.